The Breath Hold ES, developed by Medspira and physicians at a leading US hospital, uses a biofeedback and display technique that enables patients to self-monitor their breath-holds or to control breaths during periods of shallow breathing (1,2). 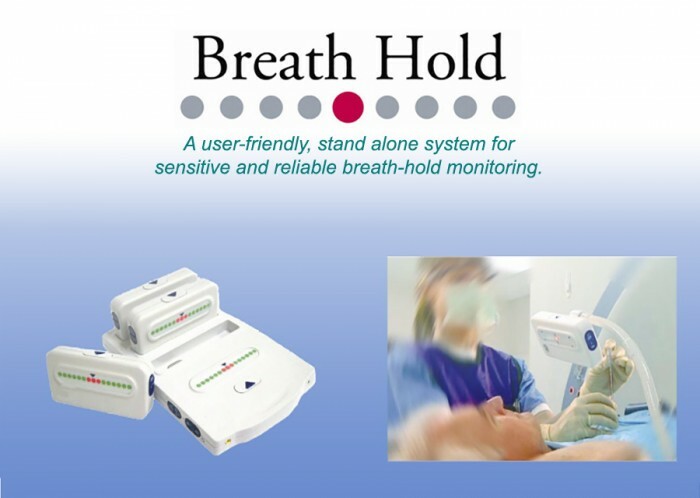 Pentland Medical are marketing this device in the UK as Breath Hold (3). Imaging – of the breast, chest wall, lungs and upper abdomen. Image-guided biopsy – of the breast, chest wall, lungs and upper abdomen. Image-guided radiotherapy (IGRT) – of the breast, chest wall, lungs and upper abdomen. Radiotherapy – of the breast. In radiation therapy planning and within the context of image-guided radiotherapy (IGRT), it is important to have images of the highest possible quality. By breath-holding, it is possible to minimise or eliminate breathing artefacts and distortions, resulting in better quality images. Magnetic resonance imaging (MRI) is becoming more prevalent, replacing computed tomography (CT), because it is safer for the patient, reducing potentially harmful radiation exposure. The use of Breath Hold has the potential to reduce the time needed for imaging a patient, and so reduce the radiation dose even further. Breath Hold is cost-saving as it reduces the requirement for repeat imaging due to chest wall movement during image capture. In image-guided diagnostic procedures, such as biopsy and fine needle aspiration (FNA) cytology, the device has the potential to reduce the rate of false-negative or inadequate biopsy diagnoses; both of which can occur when the sampling needle misses the tissue abnormality, due to respiratory movements (4). Breath Hold works by measuring changes in the patient’s abdominal girth with each respiration. Breath Hold uses an expandable ‘bellows’ system attached to a transducer tube, which wraps around the patient’s chest or stomach to assess respiratory pressure. In the ‘breath monitoring’ process, a reference point is selected which is typically either an inhale or exhale point. After point selection, the Breath Hold monitor indicates when the patient has their respiratory targets; additional visual alerts let the patient know if they have moved from the desired ‘hold’ position. To support a reproducible shallow respiratory pattern, patients use the visual cues from the Breath Hold monitor to maintain their breathing within a certain range. The clinical problem of control of respiratory motion will be familiar to healthcare professionals who work in imaging and radiotherapy specialties (4). Consistent breath-holds or shallow, controlled breathing. Reduction of target tissue mobility during diagnostic biopsy procedures. Biofeedback allows proactive breathing control for patients. Increased patient comfort and ease of use when compared with other respiratory motion control technologies in imaging and radiotherapy. Provides respiratory motion control for interventional radiology. Ease of set-up for each patient. In 2014, an estimated 235,000 new cases of breast cancer were diagnosed and each year approximately 40,000 women worldwide will die from breast cancer (6). Adjuvant radiation therapy, following either breast-conserving surgery or mastectomy is used to reduce the risk of local cancer recurrence. Radiation therapy to the breast and the chest causes radiation-related morbidity and mortality that may offset some of the benefits of radiation therapy (7). An important consequence of left-sided radiation therapy is damage to the heart (7). The effects of radiation on the heart can result in a spectrum of changes now termed, ‘radiation-induced heart disease’ (RIHD) (7). The chronic effects of cardiac radiation damage include pericarditis, myocardial fibrosis, coronary artery disease, pericardial effusions, valvular disease, and cardiac arrhythmia (7). Radiation damage to small- and medium-sized cardiac blood vessels results in a form of ischaemic heart disease (IHD) (8). Since 2001, studies have shown that deep inspirational breath holding during tangential breast radiotherapy can reduce the amount of irradiated cardiac tissue (9). In 2011, a CT imaging study quantified the reduction of radiation dose to the heart and lung, using deep inspiration breath-hold (10). This study concluded that cardiac and pulmonary radiation doses were reduced without compromising the target coverage (10). In 2012, deep inspiration breath holding was shown to significantly reduce the radiation dose to the heart during left breast radiotherapy (11). In 2013, a study including more than 2,000 women was published in the New England Journal of Medicine (12). The study showed that exposure of the heart to ionizing radiation during radiotherapy for breast cancer increased the patient’s subsequent risk of ischaemic heart disease (IHD) (12). This study found that the risk of IHD post-radiotherapy was proportional to the mean radiation dose to the heart (12). The damage was thought to begin within a few years after radiation exposure and to continue for at least a further 20 years (8). 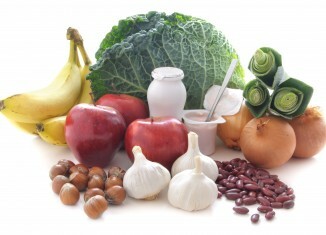 This research was partly funded by Cancer Research UK (CRUK) (12). Following this publication, there was increased recognition of the problem of inadvertent radiation damage to the heart (12,13). Some reports in the media called for recognition of this serious cardiac complication and called for greater measures to limit the development of cardiac radiation damage (13). In 2013, the results of the UK HeartSpare Study were published (14). HeartSpare was a randomised controlled study to evaluate voluntary deep inspiratory breath-hold in women undergoing breast radiotherapy (14). Two techniques were compared, voluntary deep inspiratory breath-hold and deep inspiratory breath-hold using a breathing coordinator device. Both techniques were comparable in terms of normal tissue sparing, positional reproducibility and feasibility of delivery in this study (14). ‘Despite clear dosimetric benefits, these techniques are not yet in widespread use’ (15). The organs of the upper abdomen, including the liver, stomach and kidneys, move with the respiratory movements of the chest and diaphragm. The diagnostic and therapeutic problems caused by the respiratory movement has recently been termed the ‘respiratory related target motion and set up error’ (16). Recent publications have shown that breath-holding techniques allow for greater accuracy in localising radiotherapy to the liver and stomach when used with imaging techniques (16,17). Unless breath-holding is used, there will be a large margin of irradiated normal tissue due to respiratory movement, particularly around highly mobile organs such as the stomach (16). Interventional radiologists at the University of California, San Diego, have used Breath Hold to improve targeted biopsy accuracy for complex image-guided procedures of the lungs and liver (18). Another procedure that is optimised through the use of the biofeedback characteristics of Breath Hold is ‘localisation biopsy,’ which is the insertion of localising needles or hooked wires to mark tumours for surgical excision. Breath Hold has been reported to be invaluable during these types of localisation biopsy procedures, which are affected by respiratory motion (18). Breath Hold has a wide range of potential benefits for patients requiring targeted diagnostic or treatment procedures. The cost benefits to the NHS include reduction of procedure times and the greater accuracy of imaging and treatment procedures. There are long-term cost benefits too (5). The UK has an increasing number of cancer survivors, who now live with the long-term consequences of cancer treatment (19). This population of cancer survivors is likely to increase as early cancer detection rates increase (19). It makes economic sense to reduce the long-term complications of radiation damage to normal tissues, such as the heart (12). The Breath Hold system is priced at between £10,000 to £14,000 and with negligible running costs. In conclusion, in the present climate of NHS cost-savings, combined with increased patient safety concerns, Breath Hold is a device that a modern health service cannot afford to be without. July 2nd 2015, prior to online publication.